Step up your fitness regime and get into great shape with this impressive, newly designed treadmill. Featuring a powerful 3.5HP motor, you can choose from a great range of 12 workout programs. With a program to suit any fitness level, you can manually choose your own speed, incline level and running time, using the easy to control LCD display. This blue display reveals your speed, time, incline, distance, calories, heart rate and pulse. Complete with a folding mechanism and built in wheels, this compact treadmill is easy to manoeuvre and can be easily stored away. Other great features include a body fat analyser, built-in speakers, water bottle holder, headphone jack and MP3 interface. 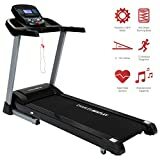 Constructed from solid steel, this high quality treadmill, will last you for years to come and is a perfect addition to any home gym. Womens Weightlifting Gloves in Black or Pink plus *FREE* Padded Figure 8 Lifting Straps for Powerlifting and Heavier Weight plus *FREE* Fox Fierce Fitness Workout for Women Ebook.